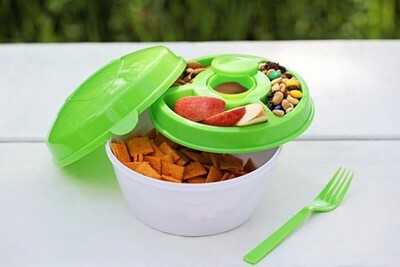 This Salad and Snack Bowl has an easy snap on lid that helps prevent accidental spillage of food. The Salad and Snack Bowl features an interior tri-section condiment wheel and dressing container to separate the food contents. The easy snap on lid prevents accidental spillage of food. The salad bowl comes with a matching fork that adds to the dining aesthetics. 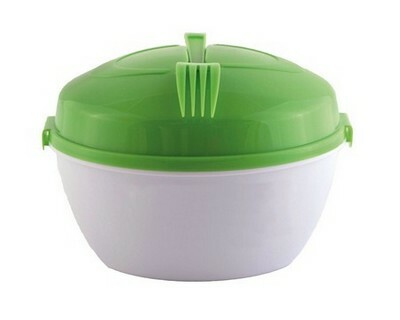 It is available as a white bowl with a leaf green lid. Imprint your company’s logo on the salad bowl and give it away at trade fairs, carnivals, cooking classes, and farmer’s markets to make your brand name omnipresent.